Welcoming new members into our Optimist Clubs is always a pleasure. It's your responsibility to help your new friends learn about the culture of your club. Every club is just a little different. Although we are united in the Optimist Creed, there are "just had to be there moments" that must be explained so that your new arrivals don't feel left out. 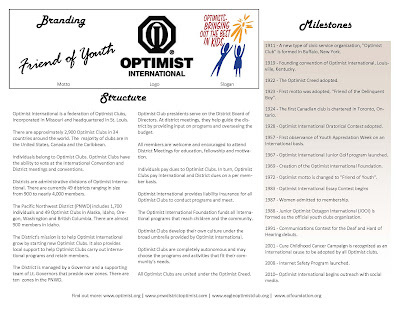 It is also wise to talk about the history of the Optimist International organization. It is both comforting and invigorating to know that our local communities are connected to something bigger and united in a similar mission with others around the world. To help you through the backstory, we're happy to provide an overview of Optimist International and the district and zone structure, milestones, and branding. Use it as a beginning to the orientation that you provide your new Optimist Club members. Keep your new Optimist Club members around by letting them know more about what we are all about. Happy recruiting! Click here to download and print the 1-page Optimist Club Orientation created by the Eagle Optimist Club.